This is a crisis. It’s a crisis of human and civil rights, it’s a crisis of our economy and our workforce, and it’s a crisis of national security. This is why we cannot wait any longer. The Comprehensive Immigration Reform for America’s Security and Prosperity (CIR ASAP) Act of 2009 is a solution that we, as a nation of immigrants, can be proud of. We’ve waited a long time for this—a workable solution to our immigration crisis. A legalization program for qualified undocumented immigrants (and their spouses and children) who would first receive a conditional nonimmigrant visa which is valid for six years, after which they could apply for legal permanent residence and eventually become U.S. citizens. The DREAM Act and AgJOBS are also included. Promotion of family unity through measures designed to keep U.S. families together. The bill contains several measures designed to reduce long backlogs in family and employment immigrant and nonimmigrant visa processing as well as other measures prevent families from being separated. Reforming the legal immigration system and creating new legal channels through the Prevent Unauthorized Migration Visa (PUM Visa) that seeks to provide for safe, humanitarian migration. A new Labor Commission would also be created to make recommendations on future legal immigration flows. The bill reforms temporary worker programs and includes measures to protect U.S. workers. Reforming enforcement activities by seeking to ensure due process, judicial review, and other protections during enforcement activities. Repeals the 287(g) program. Border security provisions which seek to enhance border security and achieve effective immigration enforcement in close collaboration with border communities. Improving conditions of detention provisions which seek to improve detention conditions, and to protect U.S. citizens, LPRs, and vulnerable populations. Improving the naturalization process and integration to encourage citizenship among immigrant communities by providing for uniform administration of the naturalization exam, creating incentives for English language acquisition programs and requiring timely response on background checks and evaluating their efficiency. 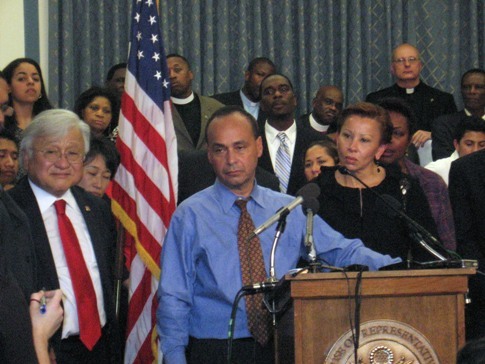 While many more immigration proposals are expected in the House and Senate in the year ahead, Congressman Gutierrez’s immigration reform bill is a good starting point for Congress to thoughtfully and sensibly craft real immigration legislation that seeks to solve our immigration problems—problems that have plagued our broken immigration system for far too long.